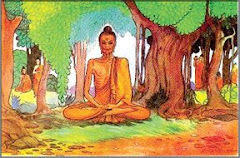 The Buddha arrived in Yim-Wai nation, where there was a grove belonging to Kausika. 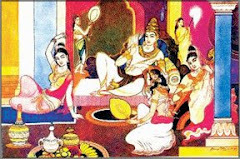 At that time the king, named Udayana, was fourteen years old. When he heard the Buddha's arrival, the king ordered his ministers and attendants to prepare his carriage. The king then went to welcome the Buddha. Seeing the Buddha from a distance the king's heart leapt with joy. 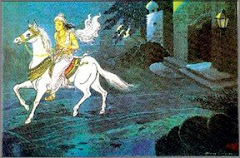 The king immediately alighted from his carriage and proceeded on foot, taking leave of his ministers, attendants, and those who carry his parasol. 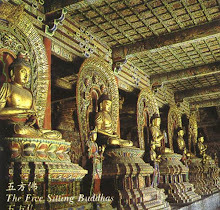 The king then greeted the Buddha, touching his forehead to the Buddha's feet and circling him three times. 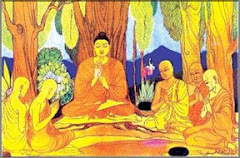 Then, kneeling with palms joined respectfully together, he addressed the Buddha saying: "In the heavens above and in the regions beneath heavens, there are no one who compare to the Buddha. 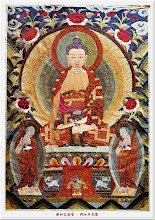 The face, eyes, and body of the Buddha now shine forth magnificently, and I never weary for a moment of gazing upon the Buddha. The Buddha is the teacher of all those in the heavens above and in the regions beneath heavens. The Buddha's compassionate heart cares for countless living beings." The Buddha, remaining silent, did not respond. The king addressed the Buddha further saying: "When people perform virtuous acts they gain good fortune, but where does this lead them? I dread no longer being able to look upon the Buddha after the Buddha gone. 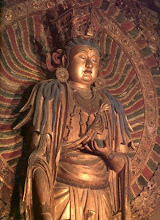 I want to produce an image of the Buddha to venerate and bequeath to later generations. What sorts of good fortune will I obtain thereby? I ask the Buddha take compassion upon me and explain this matter, as I earnestly desire to understand." The Buddha said: "Young king, your question is excellent indeed. Listen to what I say, and having heard it, take it to heart." The king said: "Yes, I am ready to receive this teaching." The Buddha said to the king: I will teach you of the good fortune to be gained by one who produces an image of the Buddha." The king said: "I am grateful." The Buddha said: "A person of this world who produces an image of the Buddha will, in a later life, have clear eyes and a handsome appearance; his body, hands, and feet will always be excellent. One born in heaven will also be exceptional among the gods in his purity, with exquisite eyes and countenance. Such is the fortune obtained by one who produce an image of the Buddha." "The place in which one who produces an image of the Buddha is born is devoid of defilement; the bodies of those born there are flawless. After death he will attain birth in the seventh Brahma heaven. Moreover, surpassing all the other gods, his handsome appearance and beauty will be without peer, and he will be honored by all the gods. Such is the fortune obtained by one who produces an image of the Buddha." "One who produces an image of Buddha will be born to a noble family, with resources far surpassing those of people in this world. He will not be born a child to a poor or destitute family in a later life. Such is the fortune obtained by one who produces an image of the Buddha." "The body of one who produces an image of the Buddha will, in a later life, always be the color of the purest gold, handsome without peer. "One who produces an image of the Buddha will most certainly be born to a wealthy family, with money and precious jewels beyond reckoning. He will always be loved by his parents, siblings, and relative. 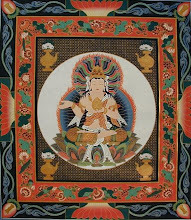 Such is the fortune obtained by one who produces an image of the Buddha. 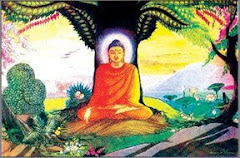 "If a person who produces an image of the Buddha will be born in Jambudvipa in his later lives, he will often be born in the families of emperors or princes, or born a child to a family of great virtue. Such is the fortune obtained by one who produces an image of the Buddha. 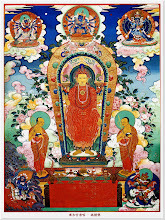 "One who produces an image of the Buddha will, in a later life, become an emperor. He will be the most honored and celebrated among all the monarchs, the one in whom all other monarchs take refuge and pay homage. Such is the fortune obtained by one who produces an image of the Buddha. "One who produces an image of the Buddha will, in a later life, become a wheel-turning king, able to ascend to Heaven and return at will. He will accomplish whatever he sets out to do. Such is the fortune obtained by one who produces an image of the Buddha. 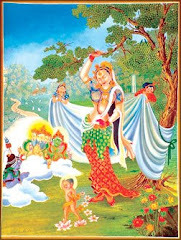 "One who produces an image of the Buddha will, in a later life, be born in the seventh Brahma Heaven. His live will span one kalpa and his wisdom will be without equal. 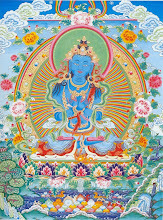 One who produces an image of the Buddha will never again be born in any of the evil paths(*) after death. He will always guard his chastity, and his thoughts will always be on his desire to follow the Buddhist path. Such is the fortune obtained by one who produces an image of the Buddha. "One who produces an image of the Buddha will, in a later life, always honor the Buddha and revere the scriptures. 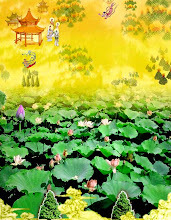 He will continually make offerings to the relics of the Buddha of variegated silk, fine flowers, exquisite incense, lamps, and all the precious jewels, and rare objects of the world. 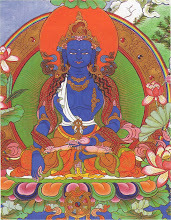 Afterwards for innumerable kalpas he will gain the path to Nirvana. Those who aspire to present precious jewel to the Buddha are not common men; they have all practiced the Buddhist path in previous lives. 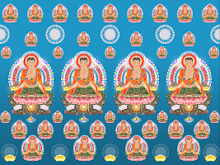 Such is the fortune obtained by one who produces an image of the Buddha. "One who produces an image of Buddha will, in later life, attain such wealth that there never will come a time when it will be exhausted; nor such wealth be calculated. It is, perhaps, possible to measure the water in all the rivers and oceans of the four quarters by measuring it out by the gallon. But the wealth attained by one who produces an image of the Buddha exceed the amount of water in the rivers and oceans of the four quarters by a factor of ten. In his future life he will be honored an protected by all. 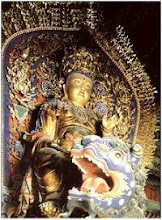 One produces an image of the Buddha can likened to one who, during a downpour, has a fine shelter -- he has nothing to fear. "One who produces an image of the Buddha will, after death, never again be born in one of the evil paths, be it hell, the animal realm, or the realm of hungry ghosts. 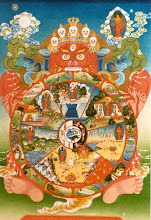 One who sees an image of the Buddha and, with a pious heart, joins palms together and takes refuge in the Buddha's stupa or his relics, will not, at death, reenter the realms of hell, animals, or hungry ghosts for one hundred kalpas. Rather, at death he will be born in heaven, and, when his long life in heaven is complete, he will once again descend into the world as the child of a wealthy family, with immeasurable precious jewels and rare objects. Afterward he will certainly attain the path of Buddhist Nirvana." 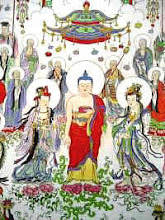 The Buddha told the king: "To produce an image of Buddha is a worthy deed, and good fortune obtained thereby is, without exaggeration, such as I have explained." 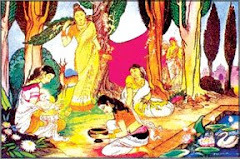 The king was pleased and bowed before the Buddha, touching his forehead to the Buddha's feet. 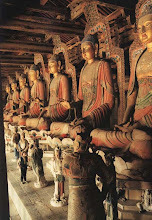 The king and all his ministers then bowed to the Buddha and took their leave. 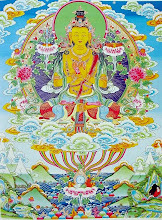 At the end of their long lives they were all reborn in the world of Amitabha Buddha.